The Clean-Up Australia Day project for Flowerdale is complete for 2015. We encourage local residents, walkers and fishing persons to continue collecting rubbish in the region as they come across it. Our group of willing rubbish busters doubled in size from last year. Consequently a greater area was covered (from Flowerdale Community House to the Flowerdale Hotel – @ 7.5 km) and more rubbish was collected. Most of the rubbish was collected along the road side, mainly empty plastic bottles, cans, and coffee cups and lids. The pedestrian path along the Creek was also cleaned up. Rubbish was clearly concentrated at culverts that take water under the road and into the King Parrot Creek. 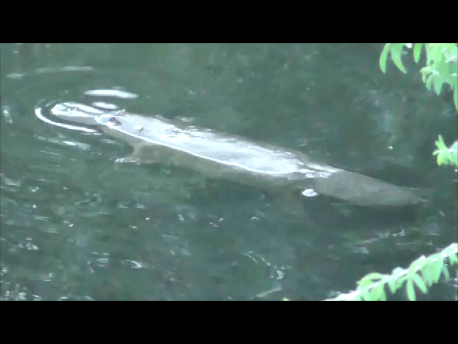 By helping to remove rubbish, these volunteers are also helping to keep the Creek environment favourable for the many creatures that inhabit the waters. 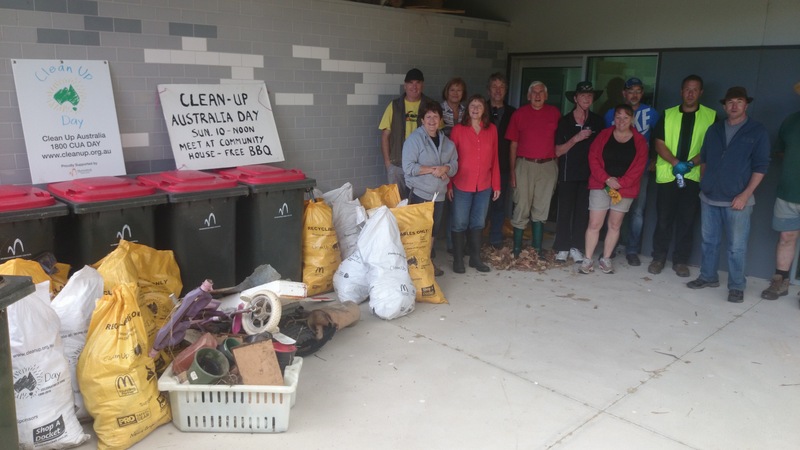 Thanks to all who participated and to the Shire of Murrindindi who supported us with lunch for the volunteers and the pick up of the collected rubbish. Australia Day in Flowerdale was celebrated at the Spring Valley Recreation Reserve. Again deserving members of the community received awards for their contribution to the community. This year awards went to Lachlan Hunter of Flowerdale Primary School and Nigel Parry captain of the local C.F.A., chosen by the Flowerdale Australia Day Committee from a number of nominations. It was a great honour to be the recipient of this award as there are so many in the Shire that contribute to the fabric of community life. 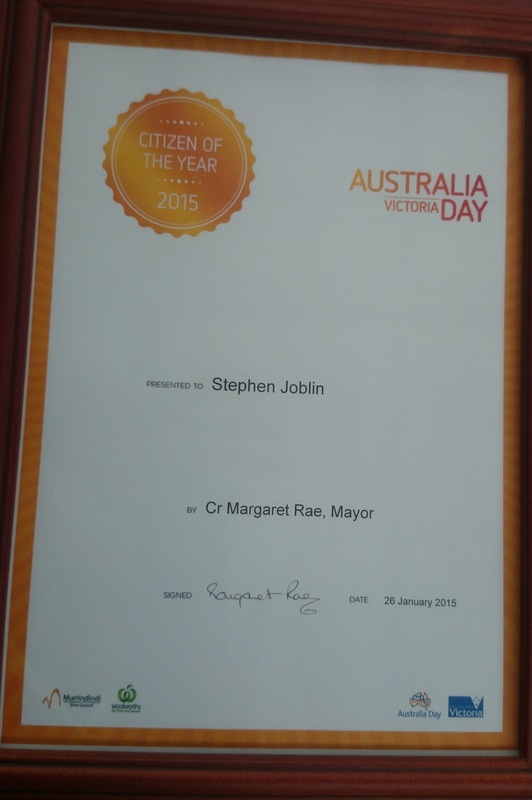 The Mayor Margaret Rae indicated that the award was for work done with Flowerdale Landcare, Yea Beekeepers, the Flowerdale Men’s Shed and Flowerdale Community House as well as 17 years active participation in the Strath Creek Landcare Group . In particular the Mayor highlighted the 100km White Ribbon Walk I made to Marysville, work in the Family Violence Initiative through the Men’s Shed and reviving observance of ANZAC Day and Remembrance Day in Flowerdale. I want to express my appreciation to my partner Heather, fellow committee members and others who have given me support and mentored me in all these valuable community initiatives. I hope that the award will assist in encouraging volunteer involvement in the community and greater awareness and care of our social and natural environments. See Calendar of Activities page for further details. 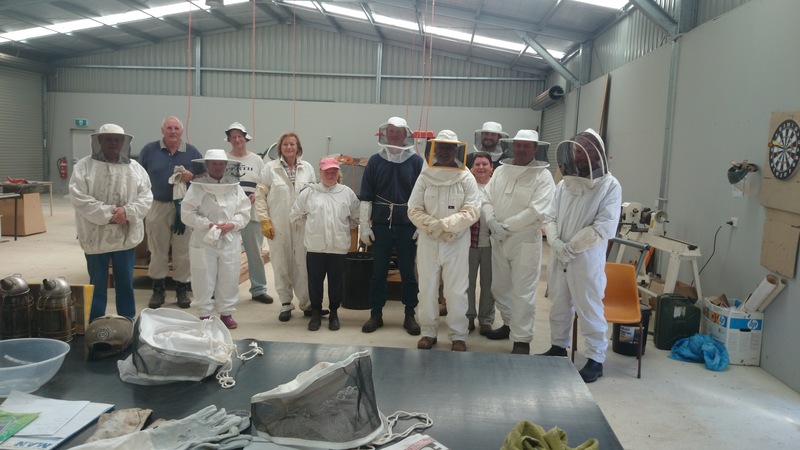 Yea Beekeepers is an informal group of some 20 or more bee enthusiasts that have been through a course run by Steve Joblin over the last 4 years. The beekeepers come together around four times a year to swap stories/experience and hold activities bee related. The last meeting of the Flowerdale Landcare committee agreed to welcome Yea Beekeepers into the Landcare Group and to offer bee related activities as part of our Landcare calendar. The logic is that beekeeping is a livestock activity and one that requires learning about the natural environment in the task of honey production. Our most recent activities were a Beekeeping for Beginners course and a Honey Harvest Day. The highlight of the Honey Harvest Day was not only extracting fresh honey, but also an interesting talk from our guest speaker Ric Stubbings on making Honey Mead. The tasting was also a highlight! December/January is a great time for observing native bees and wasps. 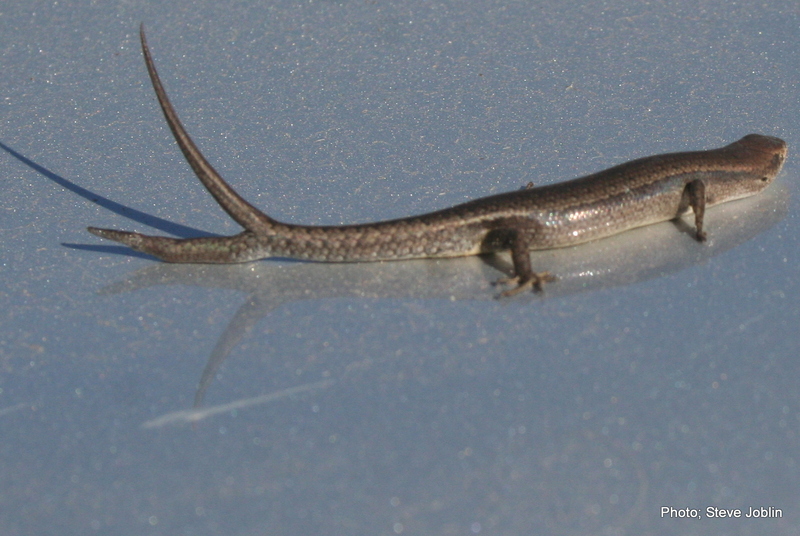 When everything else is looking for shade, these insects seem to be most active. 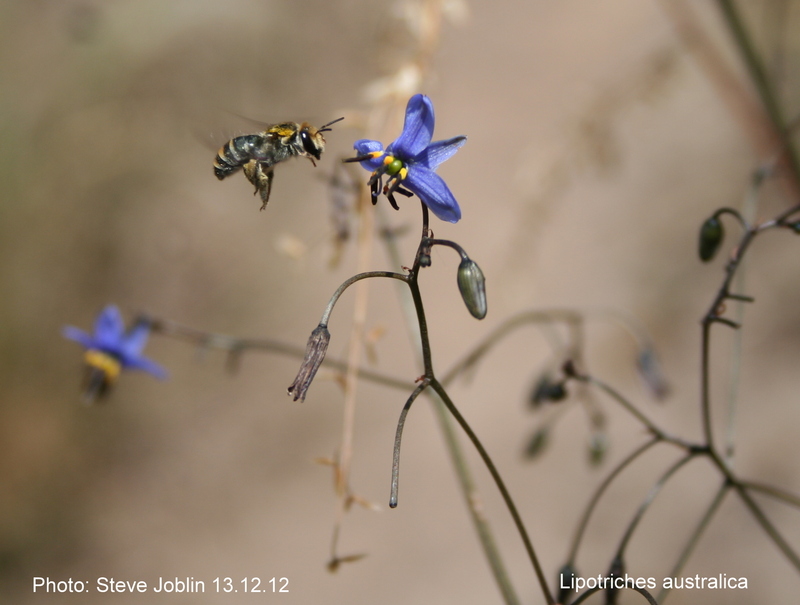 The bee in this photo is actually one of a trio of native bee species that I noticed working a bank of Black- anthered flax lilies (Dianella revoluta) on a hot December afternoon in Flowerdale. 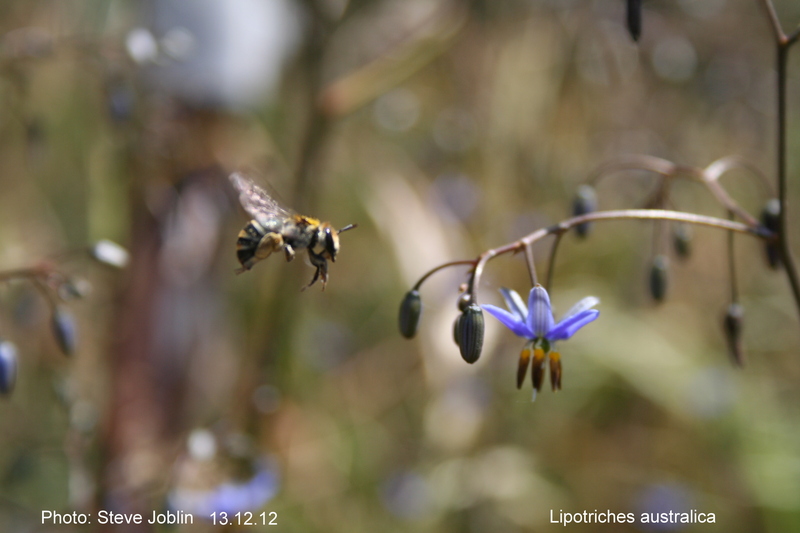 This bee as far as I can identify, is commonly known as a Green and Gold Nomia (Lipotriches australica) and is a key pollinator associated with the Pale Flax lily (Dianella longifolia) and the Black- anthered flax lily. This bee, like most of the 1500 plus species of Australian native bees is a solitary bee, each female creating her own nest. By contrast the European honeybee and the native stingless bees (Trigona carbonaria) are social bees that live as a hive with a queen bee. The Green and Gold Nomia constructs her nest by burrowing into the ground and creating cells. She places the pollen and nectar that she collects into the cell as provisions for the larva that will emerge from the egg she lays. 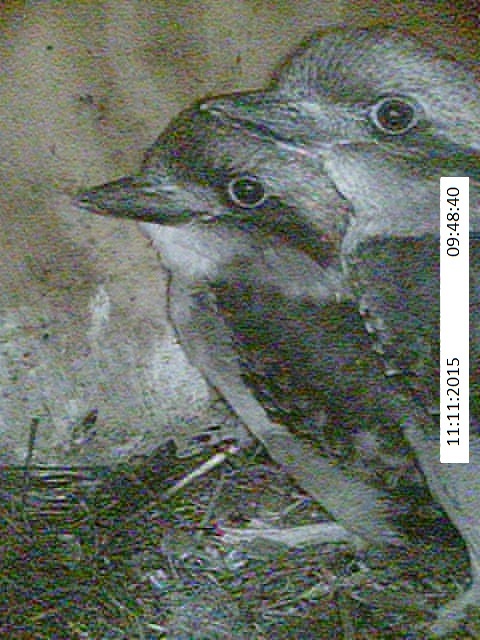 Although solitary, she can share the entrance tunnel with other females of the same species. 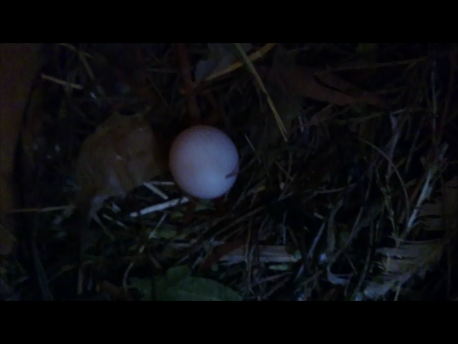 The second of the trio that I noticed is probably one that is more familiar in the Flowerdale are. This bee attracts attention with its short sharp runs and hovering in front of its flower target before darting in for a split second stay then darting off to the next flower. 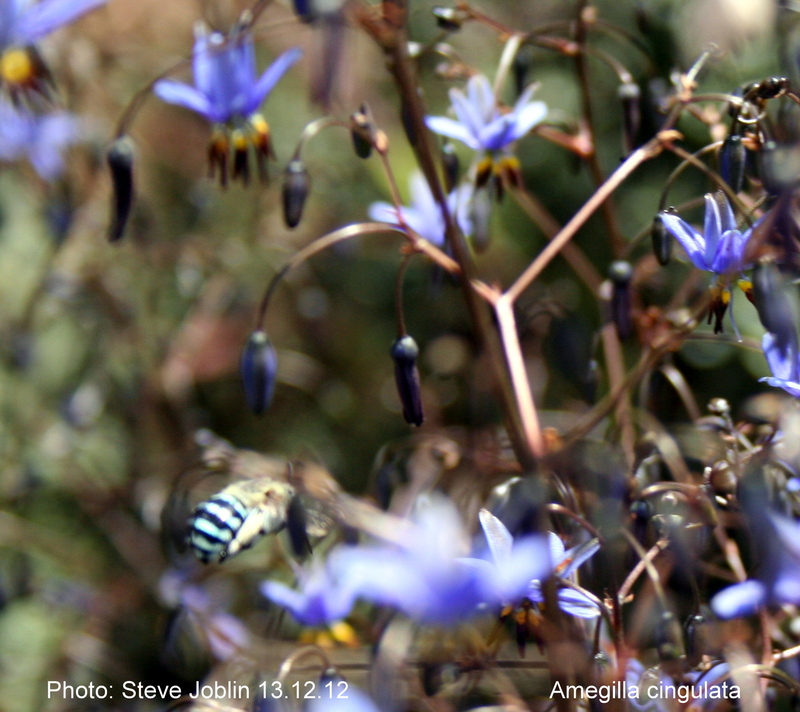 Commonly known as the Blue-banded bee (Amegilla cingulata), another solitary bee, it is highly attracted to blue flowers. 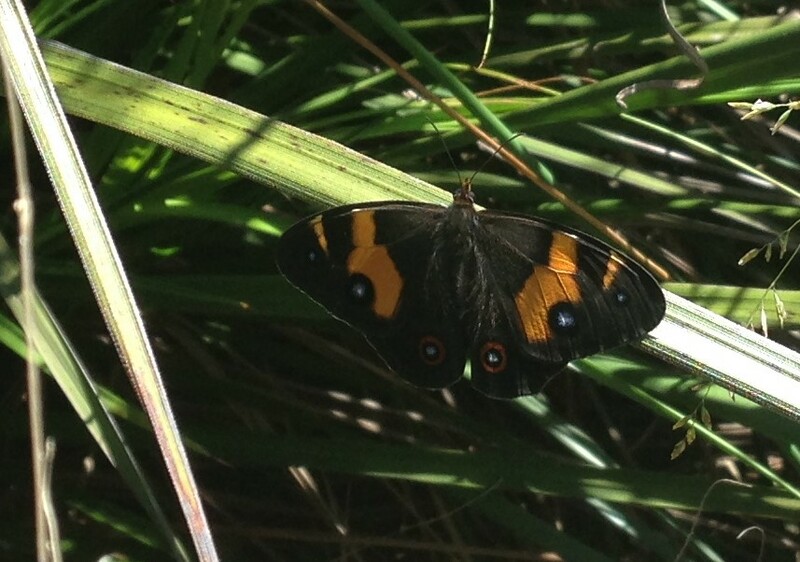 It is another important pollinator of the flax lillies. 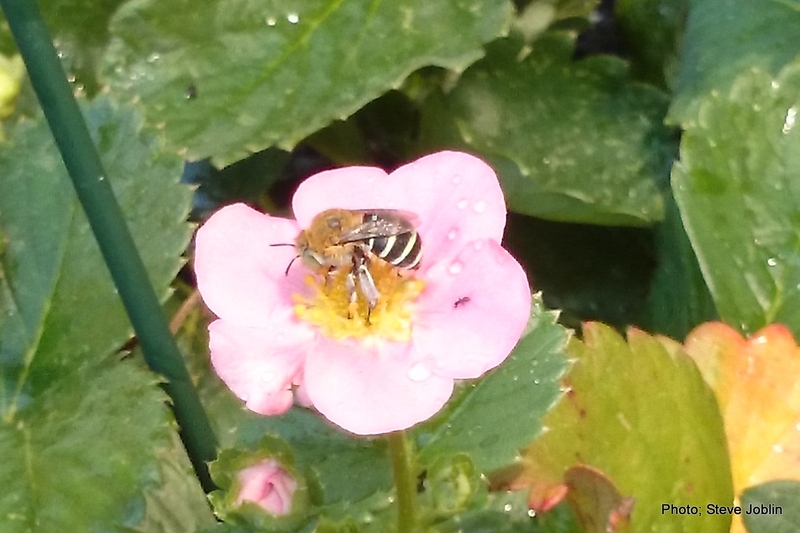 The Blue-banded bee has a peculiar method of collecting pollen through sonication also known as ‘buzz pollination’. Sonication is the rapid vibration of the muscles in the thorax between the wings that forces the release of pollen from the anther of the flower. The ‘buzz’ is quite audible. This bee is still around despite the Black-anthered flax lily having finished flowering. It can be seen visiting salvias, lobelia, lavender in the garden and tomatoes and strawberries in the hothouse. The Blue-banded bee is an effective pollinator of tomatoes and may be a back up if varroa mite enters Australia and decimates the European honeybee population. The third of the trio caught my attention with its irridescent markings as it searched the clay bank looking like a predatory wasp. It was too elusive for me to photograph but can be found by going to www.aussiebee.com.au and looking for the Neon Cuckoo bee (Thyreus nitidulus). As the name suggests, the Neon Cuckoo bee lays its egg in the nest cell of its host, in this case the Blue-banded bee, and then leaves. The unsuspecting Blue-banded bee does all the hard work of digging the nest burrow, storing provisions of nectar and pollen and sealing the cell only to have its own larvae starve as the Neon Cuckoo bee larvae make use of the food supply. 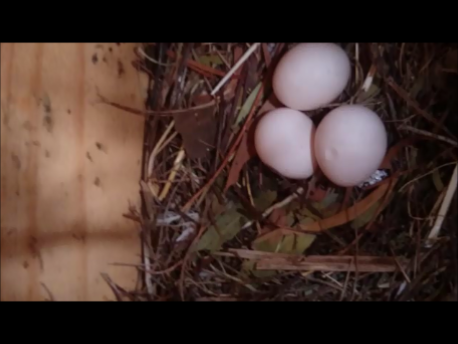 The moral of this story is that just by planting native lily species, you can create a small ecological community. The lilies need their native bees and the Neon Cuckoo bee needs the Blue-banded bee. 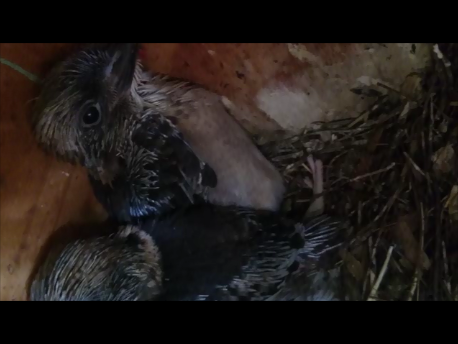 More detail on this relationship can be found at www.aff.org.au/Duncan_Dianella_final.pdf. Stay tuned to the Flowerdale Landcare site for an activities involving beekeeping during the year. 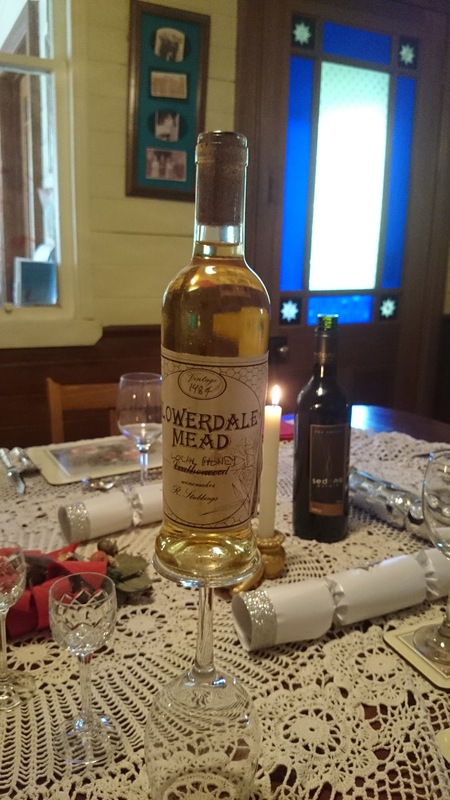 Flowerdale Men’s Shed would like to invite you to attend a Flowerdale Community Dinner at 6; 00 p.m. on Saturday the 18th of April (one week out from ANZAC Day 100). The cost of dinner and dessert is $20 per person. 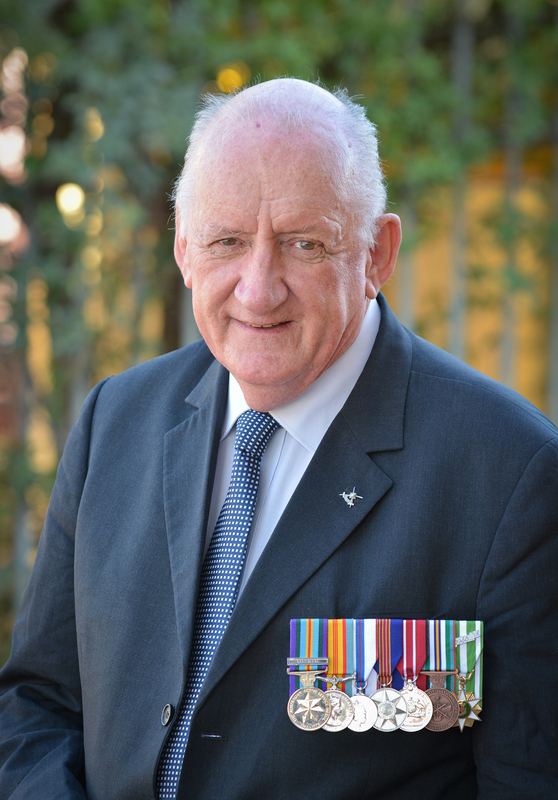 Our guest speaker is Tim Fischer, Vietnam Veteran and ex Deputy Prime Minister. Photo courtesy of Tim Fischer. “Leadership and Maestro John Monash; Australia’s Greatest Citizen General”. Copies of Tim Fischer’s book “Maestro John Monash; Australia’s Greatest Citizen General” will be available for purchase on the night at a cost of $30. Mr. Fischer has kindly offered to sign his book for the purchaser. All proceeds from book sales go to the Flowerdale Men’s Shed for use in community service projects. Flowerdale Landcare hopes that supporters of our group will book early for this event, as seats are limited. Don’t forget Australia Day Celebrations at the Spring Valley Recreation Reserve on Monday 26th of January, brought to you by the Flowerdale Sports Club.